Tonight Zach and I went to the Orlando Magic game. They played the Milwaukee Bucks. Orlando won. Why yes, I did take that picture. 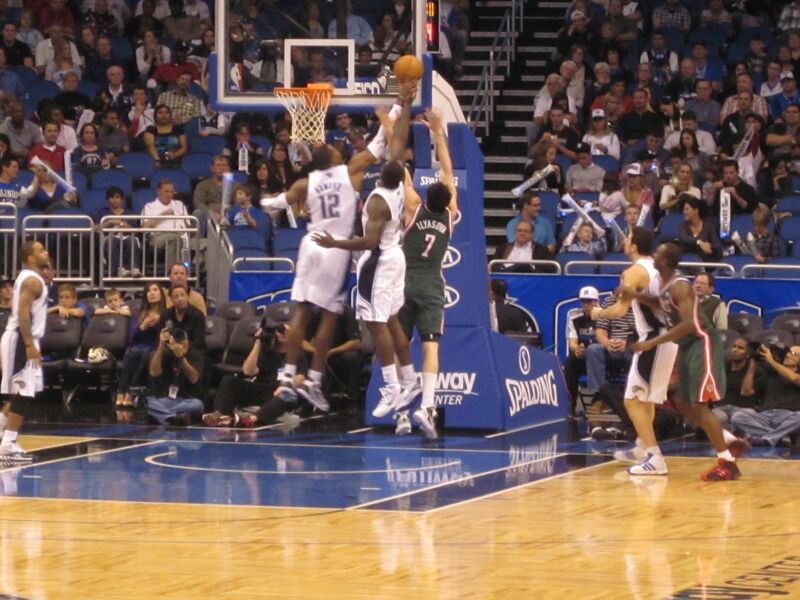 That’s Dwight Howard going for the rebound. Zach had won the tickets in a trivia contest. They were 6th row near the basket. Not bad seats at all. Of course, I took my little point and shoot because I didn’t think they would let me take Big Daddy in. Turns out I could have taken Big Daddy. Dammit. I could have gotten some amazing pictures with it. The new Amway Center is amazing. Its so spacious, and there are bathrooms and stores and food places everywhere. There’s a lot of steps, though, and the steps that go down to the seat are big, like taller than normal steps in some places. That’s not fun. But the game was fun. It was a pretty good game. 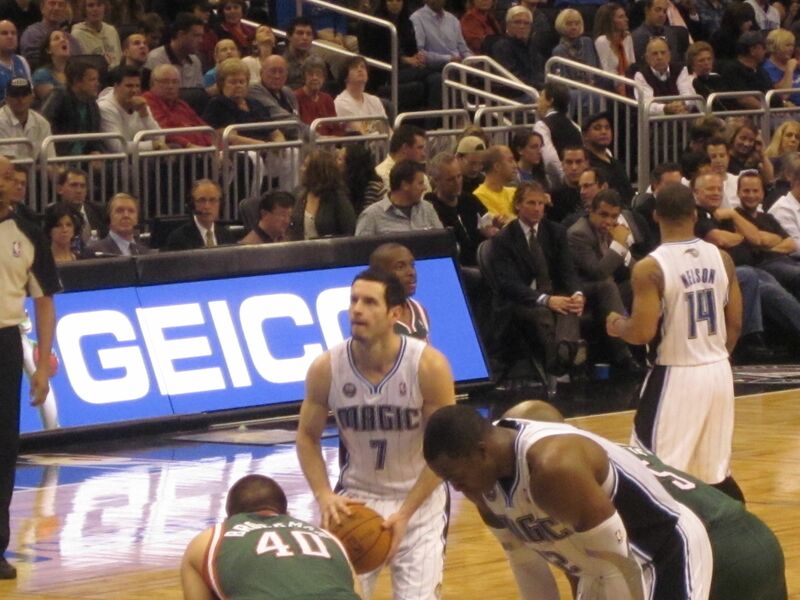 JJ Redick played a lot. I like him. Here he is shooting a free throw. I always enjoy going to Magic games. I haven’t been to one in a few years, so this was a treat. Getting home late isn’t though. My age is really starts showing when we go to things like this and get home late. I don’t handle it like I used to. I feel all destroyed. Speaking of destroyed, the house is in disarray still from taking down Christmas, plus it needs to be cleaned. I guess that’s what I’ll be doing tomorrow. Not really looking forward to that. I think I’m going to end up running a couple of errands as well. Did a few today. Plus I need to visit the mother. Oh, on that note, my dad is doing worse again. If you could keep him in your prayers I’d appreciate it. Well, dear readers. I’m going to call it a night. Enjoy yours.